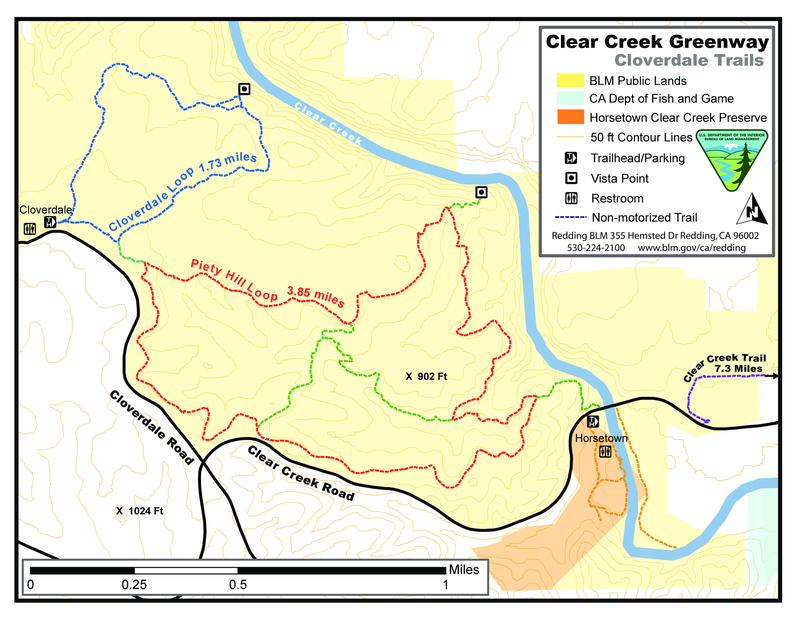 Piety Hill Loop is a part of the network of Cloverdale Trails at Clear Creek Greenway. The trail is dog friendly. The area is a part of BLM Public Lands and provides outdoor trails for hiking, biking, and horseback riding. The two loop trails, Piety Hill Loop and Cloverdale Loop, each have a lookout point with a view of Clear Creek Canyon. Clear Creek Canyon also offers great whitewater kayaking. Near the Horsetown Clear Creek Preserve (near the lower Clear Creek Bridge) tubers and novice kayakers can have fun on the run to Clear Creek Gorge. Make sure to portage before (look for the signs) the Clear Creek Gorge, it is unrunable and dangerous. As always around these areas, watch out for poison oak. On this trail, also be aware of bikers and horses. Keep an eye out for evidence of early gold mining in this area. Much of the trail is within open grasslands and oak woodlands, with grass and wildflowers in the Spring. The trail is mostly flat, and not too rugged. A great trail for hikers and mountain bikers as well. There are several views of Lassen in the distance, but the highlight of the trail is a fantastic overlook of Clear Creek Canyon. From Redding, take Placer St. about 12 miles West to Igo. Turn left of Cloverdale Road and drive about 1 mile to reach the trailhead where there is a large parking area.